A pair of hide-covered wooden drums, one long and one short, propped aginst a thornwood fence within a homestead. 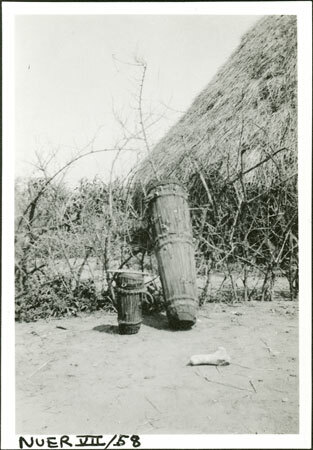 These drums were played during the dances which took place most evenings in settlements such as Yakwach. The film number suggests that this was taken at Yakwach village during Evans-Pritchard's brief return visit there in 1935. Note on print reverse ms pencil - "64 A185" & print front border ms ink - "NUER VII/58"
Morton, Chris. "Nuer drums" Southern Sudan Project (in development). 03 Jan. 2006. Pitt Rivers Museum. <http://southernsudan.prm.ox.ac.uk/details/1998.355.326.2/>.